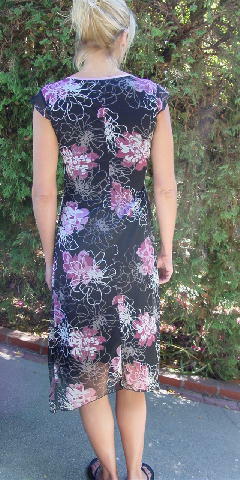 This 100% polyester dress has a sheer black shell with a floral design pattern. It has a black lining, 10" deep V neckline, and little cap sleeves. There is pink accent edging around the neckline and down both sides of the neckline where it meets the 7/8" wide pink accent, which is only sewn along its top edge. It has two pink bows in the front 12" upward from the scarf effect hemline. It's by Ruby Rox and was made in India. The floral design is in white, pink, raspberry-mauve, and gray. The tag says size M, but it fits more like a size 4/6. The slip lining is 4 3/4" shorter than the shortest part of the front. It's from a stylist's collection, and was worn once, in a photo shoot. shoulder to end of sleeve 2"
shoulder to pink horizontal accent 14 1/2"
armpit to armpit 17 3/4"